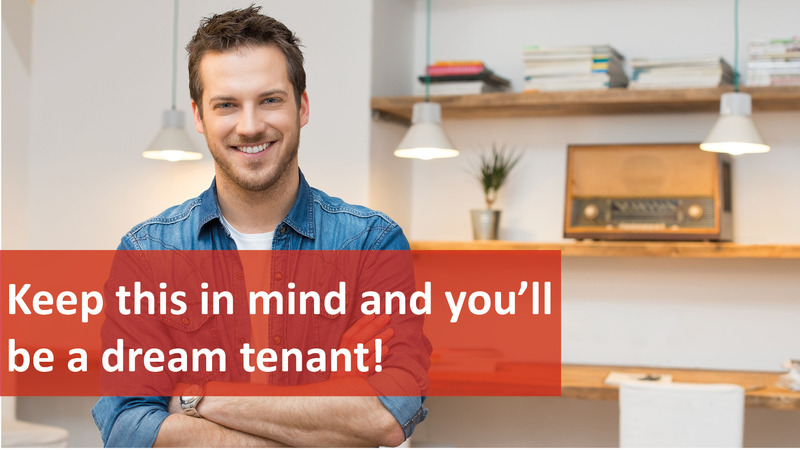 Keep this in Mind and You’ll be a Dream Tenant! If every tenant knew these ten things, life would be a little happier for everyone (especially the landlord!). This isn’t because landlords are greedy – it’s because landlords rely on that rental return for their cash flow to pay the mortgage, the expenses and make the necessary repairs to keep the property great for their tenants to live in. We all hit hard times, and it’s far better for tenants to come clean and speak to their landlord if finances are an issue. If landlords evict their tenants they risk a vacancy period and all the costs associated with new tenants, so it’s also in their best interest to find an amicable solution. Before you throw a hammer around, ask first! ‘Do it now, ask later’ doesn’t really work when we’re talking about assets worth hundreds of thousands of dollars. Many landlords would be happy to accommodate artwork being hung up, blockout curtains being installed or extra towel racks in the bathroom. There isn’t a property on the planet that hasn’t had something go wrong at some point. No-one can predict a hailstorm that damages the roof, or the neighbour’s tree roots eating into the pipes. The trick is to work together to resolve the issues; the landlord should act quickly, and the tenant should be patient and allow access when needed. A tenant losing their cool about a malfunctioning garage door won’t encourage their landlord to fix it faster. Polite language and open lines of communication will garner far better results. This is a brilliant one, because no-one wants to confess that the bathroom pipe is blocked because they cut their kids hair in the bath. However, knowing what really happened helps landlords fix problems faster. Landlords put rules in place to protect their tenants and their property. This is especially true for properties in estates with covenants or unit complexes with body corporate regulations. A landlord who knows the gas cooktop is having trouble firing up can fix the issue before it stops working completely. Landlords want their tenants to be happy, so if a renter requests an air conditioner or security screens on the windows, there’s every chance the landlord will be happy to comply. As long as it’s a reasonable request, it’s often a case of it serving both landlord and tenant well. Landlords will look after their tenants, as long as their tenants appreciate that they don’t own the property. It’s a two-way street, and when handled well, leads to a long and harmonious tenant/landlord relationship. Clearly, these ten points are based on two things: respect and common sense. A relationship based on these principles is one that is most likely to remain amicable and favourable – and isn’t that what all tenants and landlords want, in the end? If you ever have any rental questions, give us a call on (08) 6254 6300 and talk to our super friendly and helpful team.